Drupal Watchdog is the Drupal technical journal covering coding, design, workflow and hosting, written by key community contributors. ContributeIf you wish to contribute to Drupal Watchdog, please review our Submission Guidelines and then create a user account. 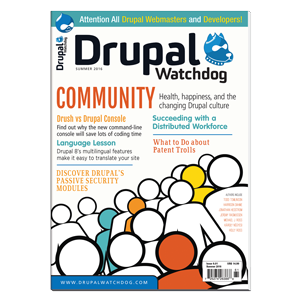 SubscribeGet 2 issues of Drupal Watchdog in 2016! We'll explore Culture in our May issue and dive into Data & Analytics in September. AdvertiseThe following full-color advertisement sizes are available for the Drupal Watchdog print magazine.